It has been a fantastic week for TBS! In true Friday fashion, I'm linking up with Lauren and Ashley to tell you all about it! TBS has over 110 readers according to Feedburner! If you haven't already, enter my celebratory giveaway! Dear Readers, You are so amazing, and I love getting to know all of you through your comments, e-mails, and tweets. Thank you for being interactive and supportive to my "little blog that could". Let's keep chuggin' along together! Mr. TBS and I had dinner with my aunt and uncle on Tuesday. We hadn't seen them since our wedding last May! Dear Aunt C & Uncle M, Thank you so much for dinner! You were our first familial visitors in Houston! It was so fun to hang out with you and catch up. I love you both so, so much! I got my Prius back from the repair shop! (Downside? The rental got scratched in the same parking garage, so I have to file another claim.) Dear Prius, Welcome back. I missed you. Dear Parking Garage Patrons, LEARN HOW TO DRIVE, or I will kick you in the shin. The overwhelmingly positive response I got to my post about blogging vs. online dating. Dear Fellow Bloggers, You are awesome at life. This is the most exciting one! Mr. TBS and I are moving into a new place! It is the most charming place that is "out in the sticks"... and it's perfect for us! We're talking 1.5 acres that is shared with one other house, huge trees, and space for days. They're even adding two small gardens for us! And we've been told that the pack of 14 wild deer visit often. So cool! Dear Mr. TBS, Our dream of a rural home came true! High five. This is going to be awesome! How was your week? Do you have anything planned for the weekend? Congrats on your new home! Can't wait to see pictures! Congrats on the blog followers AND the new digs! Sounds like a good week for you :) Happy Friday! Sounds like you had a great week! Happy Friday! AH congrats to you and your hubs! All of the pictures of me doing things outside (shooting guns/fishing) are taken in Adam's dad's backyard...he lives in the sticks and it is SO much fun! 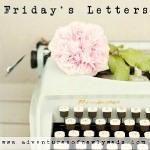 OH and I love how you combined Friday Letter & High Five...how clever are you?! Have an awesome weekend Lindsay! Congrats on your new home - that's so exciting! SO EXCITING ABOUT YOUR NEW HOME!!! it sounds lovely! unlike the scratch on your car(s) so so sorry!! YAY for a new house? What side of Htown will you be on now?! Happy packing!! Look at you ms. blog! Soon you'll be drowning in 500+ followers. I say six months in for sure. Can I win a prize for being right? And big congrats on the new home. I can't wait to see a sneak peak. Loving your blog!! You are absolutely gorgeous! Loving newest follower!